Large success of critic and of public, with a lot of the visitors the last editions. 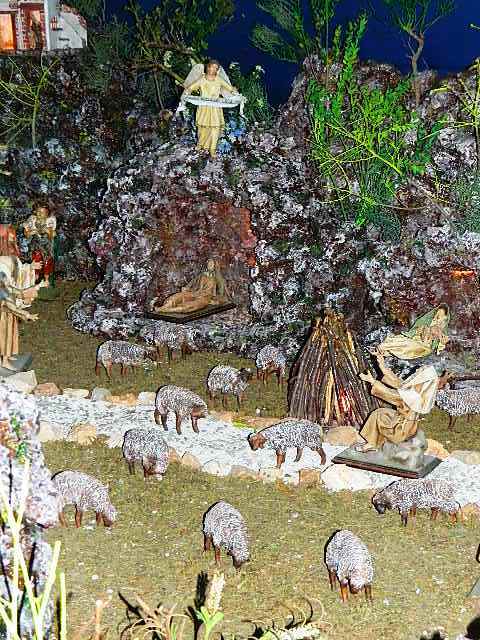 Unanimous the critic to define the Artistic Nativity Crib sole in its type: among the most attractive of Italy . In the magical atmosphere of the ancient one Palestine of the times of Jesus, all around, in about 130 square meters of exhibition, revive the characters in their environments strictly made of the so-called "ENVIRONMENTAL PAPIER-MACHE'" them, equipped of many details that leave the astonished visitor and visibly moved. Even the local paper mache figurines are of exquisite beauty , the so called Sacred Art paper mache . 2. The Visitation of Mary to St. Elizabeth. 3. Birth of John the Baptist. 4. Joseph's dream: "You will call him Jesus." 5. The Marriage of Mary and Joseph. 6. Joseph and Mary traveling from Nazareth to Bethlehem. 7. The Census under Caesar Augustus. 8. Joseph and Mary looking for an inn. 9, The Birth of Jesus. 10. The Angel Gabriel announces the birth of Jesus to the shepherd. 11. The shepherd adore the Child Jesus. 12. Circumcision of the Child Jesus. 13. Purification of Mary . 14. The Presentation of Jesus to the Temple. 15. The merchants of the Temple. 16. The Wise Men travel to Bethlehem. 17. The Wise Men adore the Child Jesus. 18. The escape of the Holy Family in Egypt. 19. Herod orders the massacre of the Innocents. 20. The Holy Family at their home in Nazareth. 21. Jesus to twelve years found again between the clergymen of the Temple. * Calvary is a sacred representation that is also part of the crib . The scenes include the Death and Resurrection of Jesus. (Scenarios under construction). The wonderful bright system imitates the phases of the day and of the night with simultaneousness and performance. Periods to visit the Crib. †- CALVARY - Death of Lord Jesus.